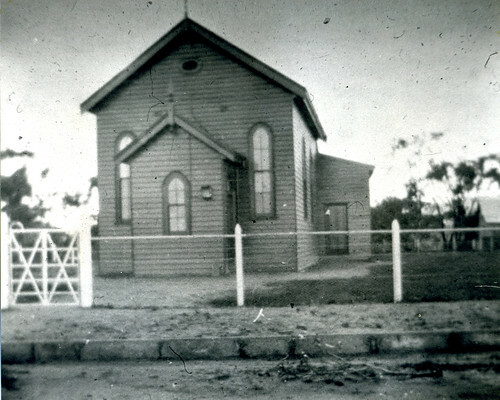 The story of the change and increase in the Blackwood Methodist Church buildings and congregation begins in 1881 when a wooden church building was erected in Young street. Up until then meetings had been held in homes and the push was on for a building to encourage the attendance of workers from the new railway line which was in the course of construction. It was on Friday, 30th June 1911, that Rev S G Carvosso took the chair at a meeting of ladies and he explained the objectives of a Ladies Guild which he desired to see inaugurated. After some discussion, a Ladies Guild was organised to assist in the spiritual and social welfare of the church. It was decided that meetings should be held on the last Friday of each month at the Blackwood Methodist Church at 2.30pm and that the subscription should be six pence per month. In 1912, land was purchased in the centre of Blackwood, opposite the two-story building which was known at the time as “The Temperance Hotel”, and in February 1917 it was resolved to move the wooden church to the new site facing onto Coromandel Parade. 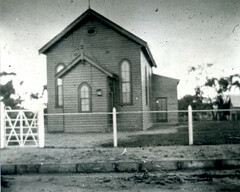 In later years, extensions were made at the back to accommodate the increased numbers in the Sunday school. These extensions consisted of lengthening the centre part of the building and adding a classroom on each side of the extended part. 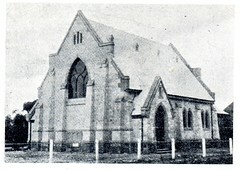 Four years later, the building of the stone church began and the opening services were held in April 1922. As well as the stone building, there were two weatherboard vestries attached to the back and the whole lot was built by Mr A E Hewett for £2,360. Mr Hewett was the mason and others who worked on the building were: carpenter – Mr R B Reid, plumber and electrician – Mr H Beanland, and plasterer – Mr H Neate. Summarising the accommodation, there was then a spacious church with vestries attached and a hall for social functions and Sunday school. In 1924, a stone building was erected at the rear of the wooden hall, this was for use by the expanding kindergarten and was made possible by a donation from Mr and Mrs D J Hewett of £500. This building was subsequently named “Hewett Hall”. A bell was presented to the church by Mrs E Gault in 1927. It was given to her by a sea captain friend and was probably one of many ship bells that became a church bell. The bell was installed on the roof of the front porch of the wooden hall. Besides its use on Sundays and other occasions to call people to worship, it was used as the local fire bell. A property was purchased next to the church in Coromandel Parade in 1954 for a manse because the manse building in Adey Road had suffered severe earthquake damage. The house was just adequate but it was handy to the church and to the centre of Blackwood. In 1956, when Rev Frank Hansen was minister, the 75th anniversary of the church was celebrated and, as well as special services, the outside of the church was floodlit at night with powerful lights on both sides. 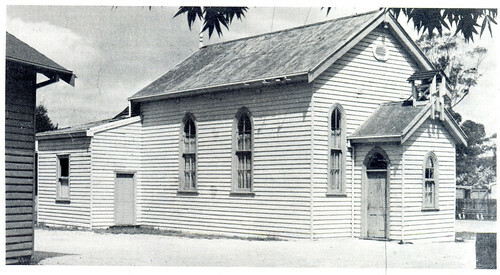 Although Sunday school and social functions were cramped on occasions and some functions were held in other local halls, there were no changes to the buildings until 1957 when the two-story building opposite on Coromandel Parade was purchased. This was the building previously mentioned as ‘The Temperance Hotel’ and it had seen many uses over the years: a private residence, boarding house, hospital and then a private residence again by the time it was purchased by the church. There were about fourteen rooms which gave very good accommodation for Sunday school classes with lock-up rooms for each class. There was a tennis court at the side which was well used. Some of the front rooms were let as offices and one room was allocated to ‘The Gift Markette’ which was a shop organized by Ruth Burrows to raise funds to help purchase the pipe organ which was later installed in 1969. The church library was established in 1966 and continues to the present time with new books, tapes, CDs and DVDs being added regularly. As well as books, CD recordings of 1976 Blackwood Church services can be borrowed. Rev Len Atkinson was the minister in 1972 when it became necessary to consolidate the church buildings on the one side of the road. Traffic had increased and safety was a factor in the decision to sell the two-story ‘Aldersgate’ building and the surrounding property to a developer for a shopping complex. A new building was erected consisting of a large hall and other function rooms, a kitchen and an office. The hall was connected to the church by a glass partition and double doors. This meant that there was some demolition. The two vestries were removed from the church and the old wooden church hall was demolished. The Hewett Hall was incorporated into the new building. 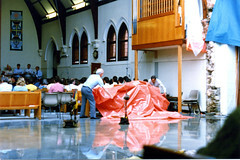 The Uniting Church in Australia was formed in 1977 while Rev David Houston was minister. This coincided with changes in society and emphasis was placed on more lay involvement and a greater place for women to take responsibility. The centenary of the church was in 1980 and there were many functions and celebrations to mark the occasion. 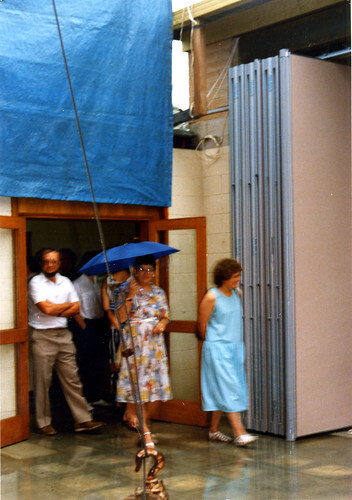 By 1985, the congregation had increased to the extent that people were sitting in the foyer, so it was decided to remove the glass partition and doors separating the sanctuary from the foyer. This helped for a time to bring the two groups closer together, but by 1987 there were requests for improvements to be made to this set-up. The gap in the back wall of the church was too narrow and there were people with no view of the front of the church at all. An engineer’s report was received which said that the opening in the back wall could be widened and, after much discussion and financial arrangements, it was decided, on 13 September 1988, to proceed to widen the “hole in the wall” as it was called and also make alterations to the offices. Calamity struck on September 27 while the workers were removing stones in the process of widening the gap – the whole wall, right from the roof, collapsed in a heap on the ground. Fortunately, no one was seriously injured but the wheelbarrow that one worker was handling was crushed under the rubble. The whole of the end of the church was now exposed to the elements and the pipe organ and console had to be covered with tarpaulins. A fine dust covered everything in every room of the complex. The heap of rubble was just behind the organ console and alongside of the organ pipes. The amazing thing was that the organ still worked perfectly! The mess was cleaned up and the roof was secured to the concrete floor, which was the foyer area, with steel ropes. It was the beginning of December 1988 before negotiations with the insurance company gave the go ahead and rebuilding was commenced. It must be remembered that the chairperson of the Property Committee, Graham Footner, spent countless hours at meetings and in court negotiating for this to happen. Services were held in the church for some time and, because the end of the church was open to the elements, the organ pipes and console were covered with tarpaulins when not in use. For the Christmas Day service, a large crowd was expected and the weather in the days preceding had been very hot and thought was given to erecting tarpaulins above the eastern wall to provide shade form the sun for the people sitting in the open area. This was, however, not acted upon and, in fact, the tarps were left off the organ console because of the fine weather. At about 3 am on Christmas day, it started to rain (see the photo at left of people arriving for the service in rain). Keith Rodda immediately drove to the church and covered the organ. The rain continued all the morning and brooms were used continuously during the service to sweep the water off the concrete. The organ was intermittently covered and uncovered and the piano was used for some of the hymns. The final result of the extended church with the matching wood studded ceiling proved to be far superior to the initial concept and the accommodation, appearance and acoustics were all excellent. Rev Rodger Bassham was minister at this time. Following on from this work it was decided to extend the foyer and build new offices. The whole project was completed and a dedication service held on 17 December 1989. 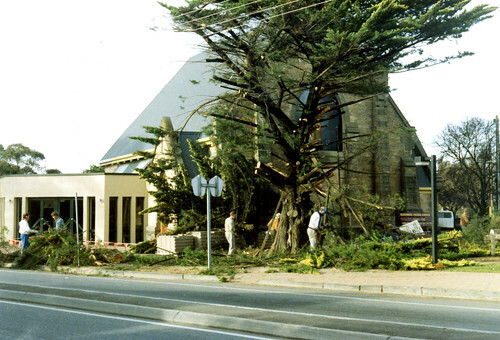 At the front of the church, there was a large Cypress tree which was planted by the church congregation in about 1920. It was now so large it overshadowed the church and engineer’s reports indicated that the roots were damaging the church building. In 1990, it was decided to remove the tree and pave some of the area and make a garden. The tree removal caused an uproar in the local area, particularly from adjacent business places. Suitable trees and garden were soon growing in the area and, after some time, the locals thought it was great. The ministers who served the parish at the time were the Revs Geoff Bridge, Rod Dyson and Doug Allington. It was in the 1990’s that ‘garage sales’ commenced and the income from each was in the vicinity of $14,000. A large proportion of this was divided between missions and the balance used for improvements to the property such as rebuilding the kitchen and installing overhead fans in the church and elsewhere. The level of the floor in Hewett Hall was always lower than the other building and was a hazard with a step down. The level of the floor was raised, in 1996, and this greatly enhanced the room and its use. 1998 was the year that parish structures were discontinued so that Blackwood Uniting functioned apart from Eden Hills, Belair and Upper Sturt. The first Church Council was formed and the ministry team was reduced to two with Rev Christine Ostle and Rev Algis Greb concluding their terms at the end of 1998. In 1999, Rev Steve Thompson joined Rev Geoff Bridge and our vision statement was formulated. By 2000, Rev Rebecca Purling was appointed part time to Blackwood Uniting Church and part time to Belair Uniting Church. The 120th anniversary of Blackwood Church [click to see more on the 120th anniversary] was celebrated in 2001 and in 2006 Rev Leanne Jenske became the full-time minister. She was joined in 2007 by Rev Ian Hunter who replaced Rev Rebecca Purling on a part-time basis with Belair Church. The last ten years have seen many changes both in emphases and in the church community. Worship remains a vital element of life at the Roundabout. The numbers of children have decreased, some people have moved to other churches, but others have come and found their niche. There is still great commitment, enthusiasm and involvement by the congregation in the many activities which the church offers, as well as in service groups in the wider community. Council, in consultation with the people, continues to work towards a vision for the future and towards planning ways in which to faithfully be a 21st century church. Our vision statement provides a framework for our ongoing commitment and action. We believe we are called by God to be an inclusive Christian community, committed to justice, learning, service and care.